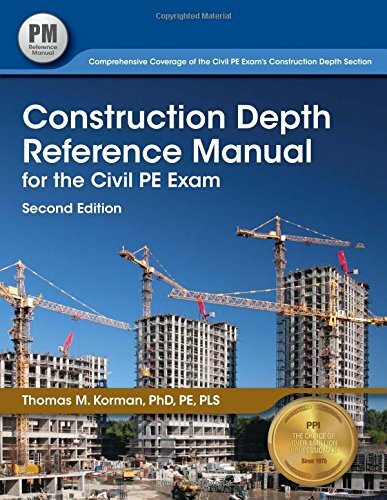 Construction Depth Reference Manual prepares you for the construction depth section of the NCEES Civil PE exam. All depth topics are covered, and exam-adopted codes and standards are frequently referenced. You will learn how to apply concepts by reviewing the 40 example problems, and you can check your solving approaches by reviewing each problem’s step-by-step solution. Access to supportive information is just as important as knowledge and problem-solving efficiency. The Construction Depth Reference Manual’s thorough index easily directs you to the codes and concepts you will need during the exam. Cross references to the 163 equations, 38 tables, 93 figures, 5 appendices, and relevant codes will point you to additional support material when you need it.